Your Southern Peach: The Weekend Cheers! Cheers to the weekend! There's so much to be happy about today. Yesterday I was featured on Annette Joseph's blog which was exciting for me. I've followed her work for a few years now so it was an honor for me to be featured in her "Cocktail of the Week" series. 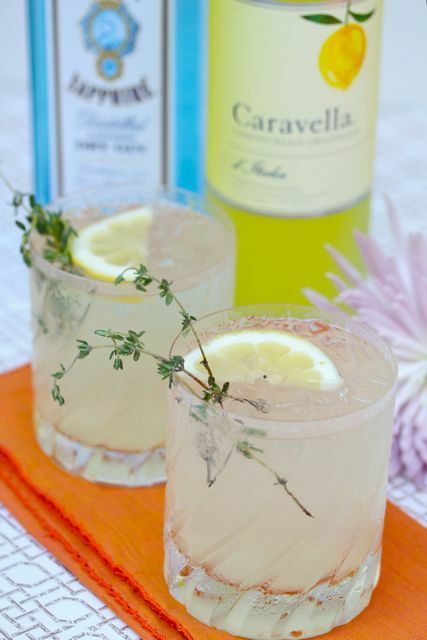 I mixed up this elegant limoncello-gin cocktail that's perfect for this transitional season. Annette is a photo stylist/producer for many magazines like Southern Living, Better Homes and Gardens, This Old House and DIY Magazine. She's also a regular contributor to The Today Show and Better Mornings. Kind of a dream job, right? It's always fun to cross paths (even if it is just via social media) with someone who's work you admire. I hope you'll click over and check out her fascinating portfolio. Also, we're headed down to the Gulf today in hopes of a few more days of summer fun. I really feel the need to unplug and recharge a bit right now but don't worry, I have some fun posts scheduled to keep the blog alive while I'm gone. Wishing you a perfect weekend. Oooo, that drink sounds great! Perfect way to say farewell to the summer with a refreshing cocktail. Enjoy your time away from the blog - unplug and unwind! Congrats on your feature!!!! So happy for you. Have a great time on the Gulf! I "invented" a new cocktail tonight and thought of you! I had a tiny bottle of caramel flavored vodka and added it to a mug of warmed tea and spiced apple cider mix. Perfect for autumn! @cristanh that sounds so very yummy! I've always wanted to try that caramel vodka and I think this fall I may have to give it a go.